When you are faced with a survival situation where you have to bug out, you won’t be able to take all your containers, dishes, and tools with you. There just won’t be room in your backpack. Hopefully, you will have a bug out location already set up where you can store extra containers and tools, etc. But what if you don’t have a bug out location in mind? 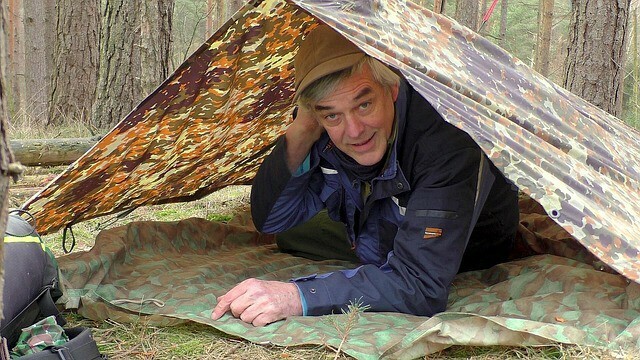 Or what if something unexpected happens and you end up living in the woods for an extended period of time with just the contents of your bug out bag to get by? Perhaps a tool that you did bring with you gets broken or needs a repair and you need something to use in the meantime. Although making your own containers and tools out of clay is not something that you can do quickly, at some point you may need to take the time to make some pieces that will just make life a little easier. Mainly made up of igneous type rock, the crust of the Earth breaks down naturally to form clay. This breaking down takes millions of years and has been happening since the time of the glaciers. The three main ingredients in clay are silica, alumina, and water. There are basically two types of clay, primary which remains intact in the place where it was formed and secondary, which is in some way moved from where it was initially formed. Secondary clay typically will have additional things added to it, such as mica, iron, or quartz. Clay can be different colors, depending on the type of soil where it is found. Colors range from white to gray in the damp, cold regions and in the arid, hot areas of the world colors range from brown to a dark reddish-orange. No matter what color the clay is, it generally acts the same. The great thing about clay is that it is easy to mold by hand. It also becomes very hard or “matures” when it is heated to at least 1200 degrees Fahrenheit. Once clay has been fired to the correct temperature, it is then able to hold water. Clay exists all over the planet. It can typically be found in water sources such as ponds or lakes. It can be found near the ocean shore. It’s most commonly found in the rocky, mountainous areas of the world but because the earth shifts, clay particles can be found in just about any region. Find a place that becomes slippery when it gets wet or near a location where the topsoil has been cleared away for road repairs or some other building project, you will be more likely to find clay. Look for a muddy water where you can see clay along the edges or on the bottom. Test the clay for plasticity by scooping up a small amount and rolling it into a ball in your palm. If you can do that easily, then use the palm of your hand to roll the clay into a long tube. If you can wrap the clay tube around your finger without it cracking, then the clay should be suitable for creating containers. What Can Clay be Used for? Clay must be completely dried out and impurities removed before firing or it will crack and break. Once you dig wet clay, spread it out on a board in the sun for several days and then break it into chunks. Pulverize the dried clay with a large rock or even a large stick with the bark removed. Pick out any items that are not clay such as rocks, sticks, etc. Once you have a dried powder of clay that has all the largest impurities removed, add the powder into a bucket of clean water and let it soak overnight. Use a piece of very fine mesh screen and pour the wet clay powder through the screen so that it filters down through into another container. Impurities you couldn’t see with your eyes have now been removed. Let this mixture settle so that you can scoop most of the water off the top. The more you filter impurities from your clay, the “purer” it will be and the more likely that your end container will survive the firing process. Once impurities have been removed from your clay, you need to wedge or mix the clay together so that it is in a usable form. Mix the clay powder with water to form a large chunk. Cut and fold the clay together over and over, typically about a dozen times, in order to mix everything together evenly. Use some of the clay powder and mix it with water to form a soupy mixture of clay called “slip”. You can use the slip as you are making your various pieces of pottery to basically glue the different pieces together and ensure that they will hold together. Clay “temper” can be made from any pieces of pottery that don’t make it through the firing process. Break up and pulverize broken pieces of pottery into a very fine powder. This will be your “temper” for your next batch of pottery. You will add the pulverized temper powder to your clay during processing. Using “temper” when making your clay increases the strength of the pottery and reduces the likelihood that it will break or crack during the firing process. 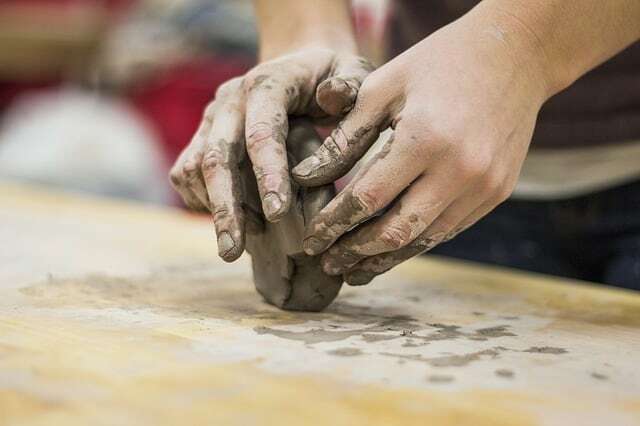 Once you have a clay that has impurities removed and is ready to work with, you need to form your containers or tools and then fire them to make them strong. Whenever possible, make more containers than you need, the firing process can be very tricky and failure rate can be as much as 50%. If you are truly in a primitive situation, here’s a video on how to make a clay skillet and other pottery to use for survival purposes using mainly materials found in the woods. Clay that is too sandy or too rocky will be much more difficult to work with and will likely need purer clay added to it in order to make pottery containers. Let clay pottery items sit out in the sun for up to 24 to 48 hours before the firing process. The drier your clay is before the firing process, the more likely that your pottery will survive firing without cracking. Cover your clay items overnight to prevent dew from falling on it and adding moisture back into the clay. Organic matter in your clay (leaves, grass, etc.) will affect the end result. The more filtered or “pure” your clay is, the better it will do during the firing process. Clay can become sticky, so make sure that you have a way to remove the clay from your work surface without too much trouble. When firing your clay objects, make sure that your fire is as hot as you can get it. Let pots cool gradually. Clay objects that cool off too quickly will make a popping sound which means they have probably cracked or broken. In order to give your clay pots and other items the fortitude they must have to hold up under repeated use, you must carefully fire the clay. To do this you will need to build a fire pit. Dig a hole big enough to put all of your clay objects inside and with space to place wood all around them. Slowly heat the pottery by placing it around the outside of the fire and moving it closer a little at a time. Build a wall up around the pit using large rocks or bricks. If available, place a grate over the fire pit and allow the pottery to dry on the grate for some additional time. Once the pottery is adequately dried out, place your items in the bottom of the pit and build an upside down pyramid of fuel, largest pieces of wood at the bottom with smaller sticks and kindling at the top. Light the fire so it burns from the top down. It’s best if the fire burns as hot as it possibly can until there is nothing left but ashes around your pottery. Let cool slowly and completely before removing pottery from the ash. You may need to let cool for up to 24 hours or more so be patient. Once your items have been fired, you can clean them with a wire brush and water. Knowing how to find, dig, and process natural clay is certainly a good survival skill to have. Keep in mind that clay has great water repellant qualities and can also be used as a sealant or glue when building a shelter, outdoor oven, or other structures. Although creating your own pots, dishes, containers, utensils, and tools from clay that you find in the wilderness may not be the ideal way because of the time involved, it is quite possible to do. For those who want to be prepared for whatever may come their way, it’s a good idea to scout out and mark on your bug out map in advance any places where you find clay. If you find yourself in a bug out situation, without a container or utensil that you need, consider making your own clay for survival purposes. Good article, living in northern FL I will have to see if there is clay in my area. JohnP in N Fla, look below top soil. In mid Fla, it’s found near solid white sand and slate gray sand 1 foot to 2 feet below the surface. We were close to a small bay. Hope this helps. Fantastic article – very concise and informative. That’s one thing I’ve never scouted my BOL for, but will definitely do so soon!